As this hit the streets in the sweltering heat of late summer 1948, with pavement melting temperatures across much of the northeast as the mercury zoomed upwards in thermometers, the rock instrumental was reigning supreme. As we’ve seen this month these records were about all that were being released by companies hoping cash in on the craze that had begun the previous winter and had gained momentum ever since. Everywhere you turned it seemed there was a saxophone moaning low or honking loudly with nary a vocalist in sight. In fact, for the August 14th edition of the Billboard Race listings three of the Top Fifteen songs on the Jukebox Charts were rock instrumentals to go with three rock vocal sides while the remaining entries were comprised largely of the older guard still clinging to the hope that all this noise was just a short-lived fad. It was getting harder than ever to be convinced that was the case though. The song sitting a top those charts for the second week, not to mention having recently concluded a run as the #1 Best Seller in the field, was none other than Sonny Thompson’s previous record, Long Gone, released way back before the flowers were even in bloom in March, and which was showing absolutely no signs of slacking off anytime soon. A review in the music press this month stated that Thompson was “Rock’n ’em right out of their seats at the 125th St. Apollo“, the mecca of black venues which meant his popularity was still sizzling hot. Faced with such a situation, what’s a record label to do? That’s far from an ironic rhetorical question. It’s a legitimate quandary, one that labels are happy to have I suppose – much better than having no hits to take into consideration when planning their release schedule after all – but it presents a rather unique problem. Does the company in question sit on a record they have in the pipeline to let the hit fully run its course, in the process possibly letting the next record fall behind the curve when it comes to the freshest sounds, even potentially waiting too long and risk losing the artist’s momentum? Or do they release a similar themed follow-up and worry that either it will cut into the still-thriving market for their earlier hit, or perhaps worse, have it get lost in the first record’s still formidable shadow, especially if the next record is just simply not as good, or too close in style and thus seen as little more than a warmed over retread? Now imagine your success or failure as a label, at least your solvency for the upcoming months, rests on making the right decision. Miracle Records had little choice but to release it and hope for the best. Their operation was decidedly small time. In fact, they essentially had two name artists, Memphis Slim was their designated bluesman, Sonny Thompson and his aggregate group of instrumental hot shots comprised everything else, either backing the likes of vocalist Gladys Palmer and other commercial lightweights, or releasing records under Thompson’s name. That was largely the extent of the label’s entire output, so it’s not as if they had many options unless they wanted to record the janitor whistling an off-key tune as he swept up the studio floor in between stealing nips from a bottle stashed in the piano. Furthermore, while they were still wracking up sales on Long Gone, the Jukebox spins where instrumentals generally did best weren’t netting them quite the profit once they’d been purchased by the operators who stocked them. Yes more spins might result in more sales from interested listeners, along with more re-orders by the ops who needed to replace records worn down from so many plays (remember, records wore out quickly then), but basically once they were stocked, that was it. In fact as was usually the case with independent labels, they often found it hard to get paid by their distributors for the records they’d already shipped, especially for a huge hit bought on credit. After all, the distributors had the labels over a barrel. The demand for the record would only last so long and the company had to have it available in order to reap any profit on it. The distributors were their means of getting it to the public and if they weren’t quick to pay, well, what could the label do, withhold the record and cost themselves sales in the brief window they had to capitalize on its popularity? So the distributors frequently held back paying and unless the label had something to follow it up with that promised to be equally successful – which they COULD threaten to hold back from delinquent distributors before it was released until they got paid for the last one – those creditors could stiff them altogether. This meant that a hit could in fact break a small label who couldn’t afford to press many more records unless their accounts due came in. What Miracle Records needed was to a provide a little incentive to pay up for those still claiming the check was in the mail. What better way to ensure those accounts receivable for their still thriving hit would start coming in than by offering, but then withholding unless they coughed up the dough, the hot off the presses next Thompson release? So before the last refrains of Part Two faded here came Late Freight to try and coax distributors and listeners alike into forking over a few more dollars to hear this one as well. Whaddya know… incredibly, it actually worked. 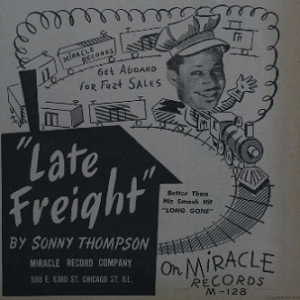 Late Freight became Thompson’s second #1 hit in the year, making him the top charting artist of 1948 when in fact he’d entered it as almost an afterthought. I say incredibly not because it isn’t a good song, but because it’s essentially the same type of moody piece that seemed unlikely to become a hit ONCE let alone twice. What’s even more interesting is that it was cut way back in December, just about two weeks after Long Gone Part 2, which itself wouldn’t be released for four months and so nobody had any inkling of an idea that it’d actually go on to become such a sensation. Yet someone – probably Thompson himself – immediately understood the magic they had in the studio laying down that simple churning groove, topped by Eddie Chamblee’s sax, so they brought the horn player back for another go-round with the de facto studio group trying to capture something similar. When that initial record became the smash hit of the spring and summer they’d be proven correct and thus wouldn’t be forced to sneak into the studio and break the recording ban to try and come up with a sequel on the spot, something which may have been forced and artificial once they knew the outcome of the first song. Instead they seemed to know it worked aesthetically right from the start and simply doubled down on their bet, with Chamblee returning to the fold as the icing on the cake to cut something similar while the mood was still fresh in everyone’s mind. All of that is somewhat refreshing (pardon the pun). An artist making a creative decision based on instinct rather than commercial response and then having that instinct be proven right by the commercial response. They then can release the naturally conceived (as opposed to hastily contrived) follow-up and are rewarded when that does just as well. It was if Thompson was rolling sevens and elevens with startling regularity while rolling around in fields of four-leaf clovers while rabbits sawed their own ankles and tossed him their severed feet voluntarily. So while Thompson and company are to be universally commended for their decisions and they reaped the rewards they were due, in retrospect the record itself… well, let’s just say it’s no Long Gone. Though by no means a rehash, it’s not drastically different either. In fact, what worked so well that first time around gets somewhat subdued here, downplayed even, the emphasis taken off its best features. I suppose it’s commendable that they didn’t simply try and blatantly copy what they’d already done (of course, not knowing it’d succeed may also have helped prevent that fate), but they certainly didn’t improve any of the components that had worked so well the first time around either. Nor did they shake things up and head off in a different direction entirely. No, here they go for the same basic feel but everything is just a touch out of step. Not awkwardly so, everything on Late Freight fits, and it’s played well all around, but something’s missing. It doesn’t quite rivet your attention. That elusive quality that sets the best things apart, hard to define and harder to replicate, does them in as the individual components, while solid unto themselves, just don’t add up to quite as much this time around. Where Long Gone had a relentless groove that locked your focus in, keeping you in a trance as it churned relentlessly, Late Freight is comparatively laid-back by nature and requires more concentration to follow, a cardinal sin when trying to attract attention without any lyrical assistance. Whereas every instrument had a clearly defined role on Long Gone, each commanding the spotlight in turn, memorable hook building on memorable hook, Late Freight finds the same musicians wandering in and out somewhat aimlessly. It’s choppier in structure, the guitar and piano are prominent but don’t carry the melody at all, forcing Eddie Chamblee’s sax to handle that task by himself, except the melody itself is nowhere near as seductive or memorable. They’re not sloppy in any way, each deftly steps around one another with the utmost skill, but none of them demands to noticed either and you find yourself unable to recall the last refrain mere moments after it ends. Long Gone, despite being two parts and thus twice as long, seemed to consistently ramp up the tension by virtue of that undulating riff that kept everything locked in so that by the end of Part Two you were on the edge of your seat and seemed utterly drained when it faded. By contrast Late Freight relaxes you, acting as a pleasant musical sedative – enjoyable as you drift off to dreamland, but with no conscious memory of it when you wake up the next morning. A fleeting song as opposed to an addictive one. That’s hardly an insult, the song is nice enough, just not exhilarating. Its title and its overall mood reminiscent of a faraway train in the countryside, a bygone sound in the distance as the nineteen-forties inch closer to the jet age around the corner. Not archaic by any means, but somehow comforting in its simplicity. Familiar sounding, yet not memorable. You won’t ever object to hearing it, but unlike its predecessor I’m not sure you’ll ever demand to hear it again and again. Yet in 1948 people did. For more than three months in fact, as it resided comfortably alongside its more luminous predecessor on the Top Ten listings, thereby not just validating Miracle Records gamble to release it when they did, but also in the process solidifying Thompson’s reputation while providing more ammunition to the growing instrumental explosion in rock that defined the latter half of the year. But for all of its success it’s also notable that when Late Freight dropped off those charts, Long Gone, four months older, but still sounding newer, stuck around in the best sellers a little bit longer, as it still provided listeners with a sound they simply could not get enough of. Oh well, a Number One hit is a Number One hit and I can understand why Late Freight was appreciated, I appreciate it myself. But I can’t help but think of it almost as a last moment to catch your breath before the clattering musical future comes hurtling down that same track when morning comes. 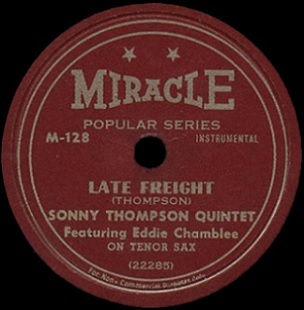 Leave a reply on "Sonny Thompson: “Late Freight”"